A couple months back at the Blogs With Balls Conference, former SportsCenter host, Josh Elliott (now with Good Morning America), confirmed what many sports media enthusiasts had concluded for quite some time. 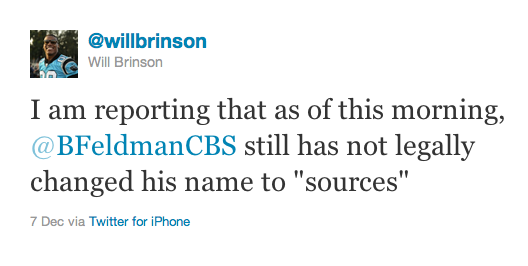 ESPN would often confirm already broken stories without attributing the story to another media organization. Andrew Bucholtz was one of many in attendance who took note of the revelation as this seemingly standard practice hadn’t really been confronted or confirmed in any way. “Elliott also criticized ESPN for its decision to start putting Chris Mortensen “reports” that were reworkings of other organizations’ football stories on their ticker. Elliott said he made his concerns known to his bosses, but they never went too far. “It’s such a big place,” he said. Of late the practice has begun to rankle those within the business as ESPN continues to utilize the tactic in the moments and hours after news initially breaks. Dan Patrick has quite the monologue on the topic, which I implore you to listen to below as ESPN tried to piggyback off Yahoo’s Tim Brown’s scoop of the Angels’ signing of Albert Pujols. 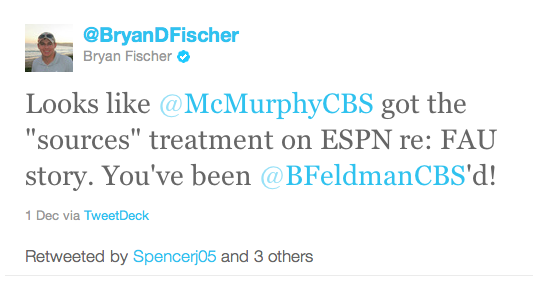 Those are strong words and you can tell it’s a topic the former ESPN host is passionate about. I’d quote the good parts, but really the entire two minutes packs a good punch. Patrick isn’t alone though as there has been a noticeable outcry within the industry as ESPN continues to get beat to the punch, but still goes through the act of “breaking” the story on Twitter and on live television without attributing to real people. 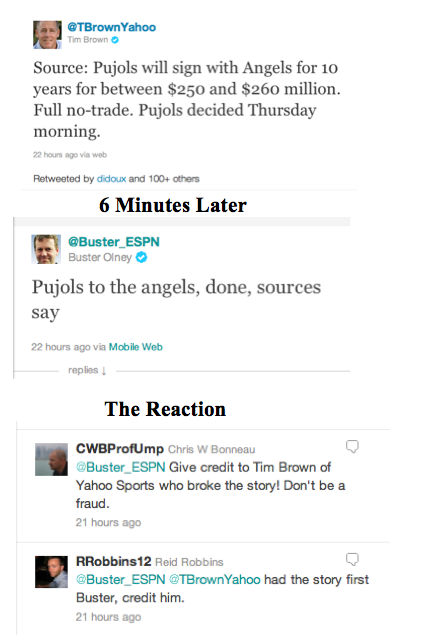 Throughout the day, tweets streamed with similar sentiments as ESPN seemed to have problems keeping pace with Yahoo and others in reporting breaking news such as the Pujols decision, the Chris Paul trade or lack thereof, and the Kansas hiring. 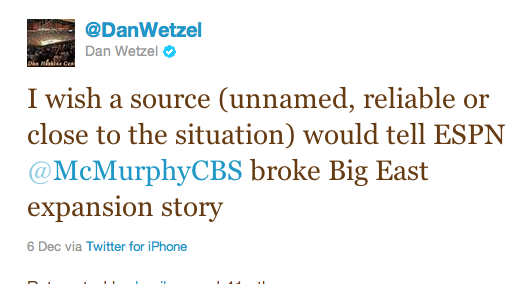 ESPN hovers around a story, but for whatever reason can’t break or get the big scoop they’re looking for. Another media organization breaks through and knowing the story will spread like wildfire, distributes the story asap as needed (Twitter, television, web story, etc). Shortly thereafter, ESPN takes the details and framing of that story and either applies mysterious wording like “sources” or “ESPN has confirmed” and essentially tells the story as if they’re breaking the story, meanwhile ducking where the story originally broke. In many cases when it’s quite clear who really broke the story, future versions of the story will give proper attribution, which to be noted happened today as ESPN’s Bottom Line and articles would later tip the hat to Yahoo for the Chris Paul deal falling apart. It seems clear that ESPN wants to be synonymous with breaking news and wants to retain anxious fans who are actively tracking a story. As soon as that news is out, people gravitate in masses to get up to date. ESPN has invented this murky shortcut of piggybacking on top of others to funnel who they can to ESPN and then figure out what they can’t claim as their own reporting after the fact. While I’m connecting some dots here, the tweets above are just many exhibits of this tactic. This coupled with Elliott’s insight of how things work internally as well as Patrick’s outrage essentially equates to a pretty solid case that ESPN’s editorial playbook embraces the tactic when things are hot and they’re behind in the game. We’ve chronicled some other datapoints in ESPN’s history where they’ve been a bit suspect in recognizing other’s original work. 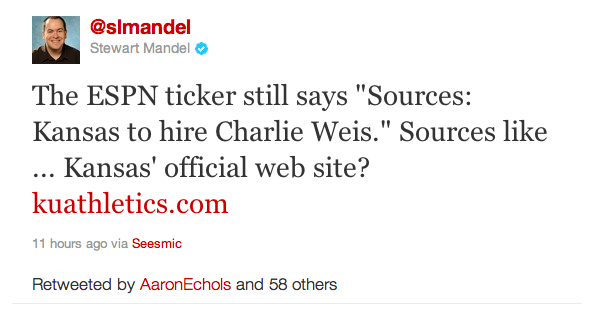 They’ve also had some memorable failings with Chip Brown vs. Joe Schad and Jay Glazer’s ownage of a lot of NFL scoops. With Elliott insinuating this comes from the top and media personalities not agreeing with the tactic, the million dollar question is just who invented and implemented the practice at the top and how exactly does it work behind the scenes? We’d love to hear from folks at ESPN about how stories that have been broken elsewhere get unboxed, unwrapped, and then repackaged as an ESPN exclusive. Is ESPN trying to break these stories on their own independently, without the use of other reports, or are they piggybacking off the work of others and inserting mysterious sources? At the end of the day, Patrick is right in saying ESPN has a lot to be proud of. However, this shady slight of hand is certainly unbecoming and probably the best way to describe it would be just bush league.